With Deadpool 2 hitting theaters starting today, director David Leitch will likely now start focusing on his highly-anticipated Fast & Furious spin-off featuring Luke Hobbs (Dwayne Johnson) and Deckard Shaw (Jason Statham). Universal has set a July 26, 2019 release date, with filming slated to begin this fall, and while doing press for Deadpool 2, David Leitch revealed that his spin-off will be more grounded than the Fast & Furious franchise it was spawned from. Here's what Leitch had to say below. "I think it's going to be a little bit more grounded because it's the beginning. It's an origin story, in a sense. It's not an origin story, but we're starting a franchise. So we want it to be a little bit more grounded, a little bit more character-centric. We're going to set up the stakes for these guys and their relationship, but we're also going to have some great set pieces and some action that you'd expect from that type of franchise." 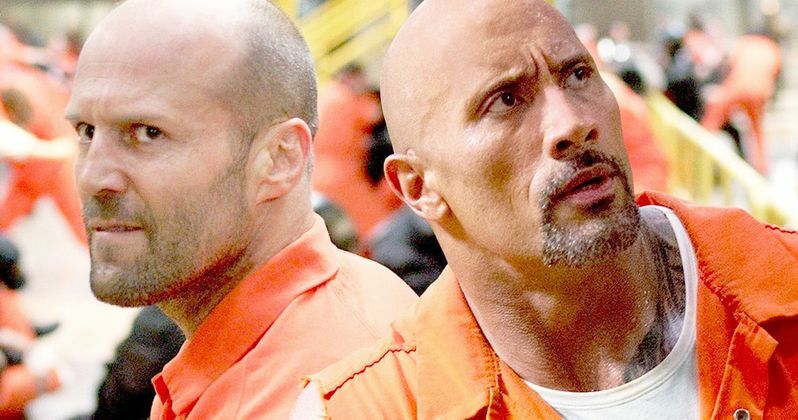 This spin-off was set up by Hobbs and Shaw meeting in prison during The Fate of the Furious, and there was also reportedly a post-credit scene that would have helped set up the spin-off, but star/producer Vin Diesel reportedly had it removed. While the flagship franchise centered around Dominic Toretto's (Vin Diesel) crew and their souped-up cars, this spin-off will delve deeper into the spy/secret agent world of Hobbs and Shaw. "We're diving into their world. I think we want to have our own take on the Fast universe. It will definitely have elements of the original DNA, but it is more drifting into Shaw's spy word and Dwayne's agent world and, obviously, we want to build on their relationship, their conflict, their banter. That chemistry that they have between them, that's sort of what's driving the movie." Chris Morgan, who has written every Fast & Furious franchise film since Tokyo Drift, is on board to write the script, but there isn't much else known about the film. This spin-off also comes as the original Fast & Furious series starts winding down, with Fast & Furious 9 set for 2020 and the final installment, Fast & Furious 10 arriving in 2021. It's possible that this spin-off could spawn a franchise itself, which Leitch revealed was always in the back of his mind. Here's what the director had to say, when asked if he approached this as making a singular film, or the start of a franchise. "I think you have to do both. I think long term. Obviously being true to the script and making the best movie, you do want to seed elements that allow you to expand the universe and have enough characters to move forward. If you look at the first Fast, they had the core group that allowed them to be able to have this ensemble that moved forward for nine movies. We have to set up the world so it has the potential to grow. That's what I'm saying with, if we're digging into their respective worlds outside of Fast, they're going to have their own universe in a sense." Aside from Johnson and Statham, no other cast members have been announced, and while Leitch admitted that "there's a way" they could include other cast members from the original Fast & Furious franchise, he didn't want to get into it because, "that's probably a little sensitive stuff right now." While he thinks it would be "a fun nod" to get other characters to make appearances, he also wants to create his own characters for this world. You can head over to Collider for their full interview with David Leitch.